The 2014 McFarlane Boston Red Sox World Series Champions box set commemorates a dramatic 2013 season that was capped off with a massive celebration in Beantown. 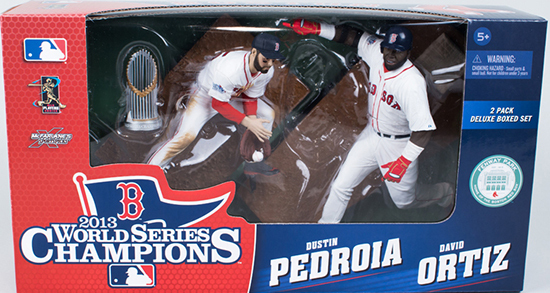 The set includes a pair of figures, David Ortiz and Dustin Pedroia. Each figure stands approximately six inches tall. They're highly detailed display pieces. An example of this can be found on the jerseys, which have the World Series patch. The likenesses are also very strong, a cornerstone of McFarlane's Sports Picks line. 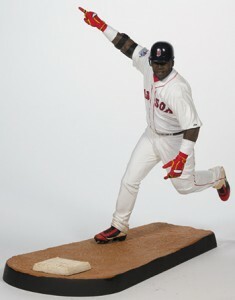 Ortiz is shown rounding the bases with his finger pointing to the sky. It is similar to his figure from MLB 18, which was released back in 2007. Pedroia is fielding a ball. It's a repainted figure from 2011's MLB 27 line. Every 2014 McFarlane Boston Red Sox World Series Champions two-pack also comes with a World Series trophy. 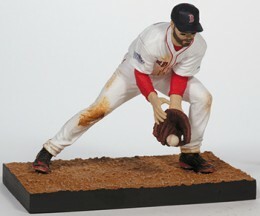 McFarlane Toys 2013 Boston Red Sox World Series DUSTIN PEDROIA DAVID ORTIZ!!!!! !